Michael Boyd, the Commodore of the Royal Ocean Racing Club and current holder of the Commodore’s Cup, will return to compete in the 2016 Volvo Round Ireland race, marking the 20th anniversary of his win, with many of the same crew from his 1996 winning yacht, Big Ears. The 18th Volvo Round Ireland Yacht Race is set to be one of the most heated editions in the race’s history say organisers with a number of prestigious international sailing champions announcing they will contest this year’s edition. Michael Boyd's choice of a J/35 as his first serious offshore racer was a shrewd decision 20 years ago. He won the Round Ireland in style with Big Ears and more recently the J/35 model has been one of the few exceptional boats to be inducted into American Sailing's Hall of Fame. In the 1996 race Boyd and his crew, minus one removed to hospital off Kerry with fractured ribs, played every tiny gain to beat Roy, Dickson's Beaumont Spirit on Channel handicap, the deciding system for determining the overall race winner. Twenty years later, the race received a major boost before Christmas with Volvo Cars Ireland coming on board as title sponsor this year after four years without sponsorship. Phillip Johnston has also confirmed that he will be entering the impressive Open 60 Artemis-Team Endeavour, the current holder of the Round Great Britain and Ireland Race, under skipper Michael Ferguson. 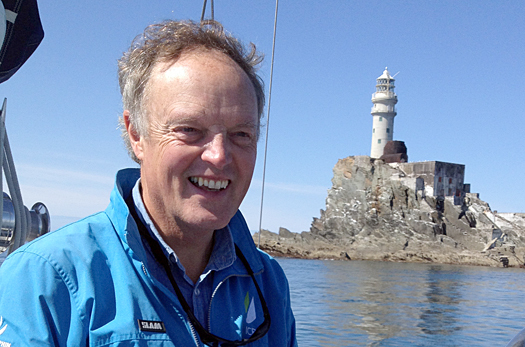 The current holder of the Fastnet Race's Roger Justice trophy Rónán Ó Siochrú has also confirmed that he will be back to contest the Round Ireland for the fourth time. At the end of 2015 internationally renowned sailor and US businessman, George David also announced his intention to enter his yacht Rambler 88 into the 2016 race. The canting keel maxi yacht would be a strong contender to break the Volvo Round Ireland Race record of 2 days 17 hours 48 minutes 47 seconds which is held by Mike Slade in ICAP Leopard 3 achieved in 2008. Meanwhile, following the announcement that 2016 will be the first time that multihulls will be invited to compete, Team Concise have already indicated their intention to enter their world-class fleet. Ned Collier Wakefield, Team Director and Skipper for Team Concise, has indicated that they intend entering their 3 boats into the 2016 Volvo Round Ireland – the MOD 70 and their 2 Class 40 boats. The Race only officially opens for entries next Monday (18th January 2016), however with the quality of entries already at such competitive levels, Race organisers expect the 2016 Volvo Round Ireland to be one of the most competitive and exciting races ever, attracting serious quality sailors and some of the finest yachts from across the world. The 2016 Volvo Round Ireland departs Wicklow Bay on Saturday 18th June 2016 with the first start at 13.00 hours.